It all started with the 2010 World Cup. Like many Americans, Sherry and I did not really follow soccer, especially on the world stage. Still, our love of traveling in Europe made us start to think a little differently. I mean, to many Europeans, soccer is everything. So, we tuned in and were hooked from the very first game. From the moment Spain hoisted the World Cup trophy as the eventual winner, we knew we would have to see a soccer game in Europe. And, every trip since then we’ve tried. Boy how we have tried. Each time we looked into it one of two things would happen. Either we were between seasons or the home team was on the road. It seemed the soccer gods were rooting against us. As the 2014 World Cup came and went, we were still looking for that first game. On our current trip to Florence we found it. 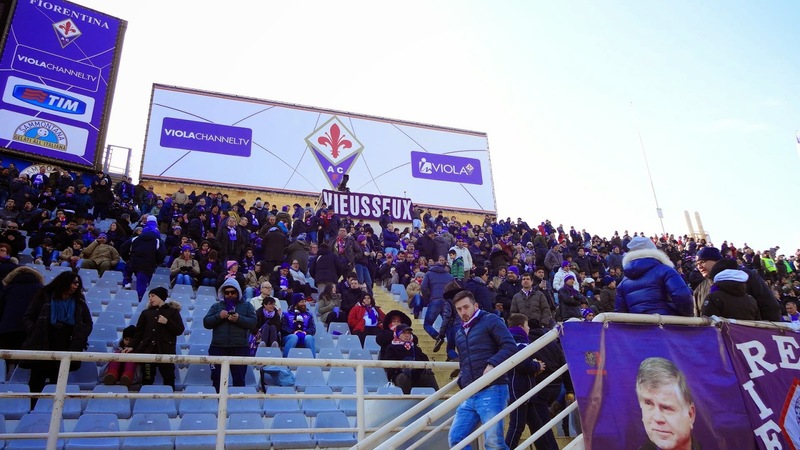 Florence is home to the Fiorentina’s or Le Viola as they are called locally since their primary color is purple, which also happens to be the color of Florence. We were able to buy tickets in advance online and were all set to see our first ever European soccer match. However, we had to do a little shopping first. I mean, if you’re going to cheer for the home team you had better dress for the part. 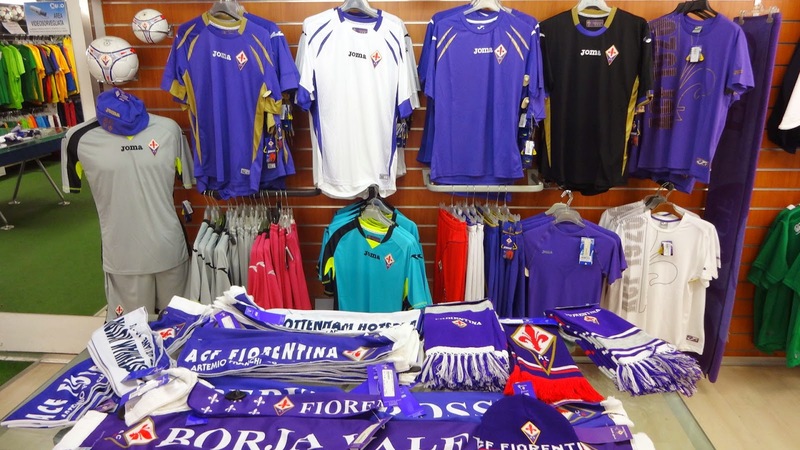 As luck would have it, there is an official Fiorentina outlet just a few doors away our apartment. We went over the day before the game and walked out a few minutes later with enough hats, scarves and t-shirts to show our support. Finally, it was game day. After a minor delay concerning our tickets we were in our seats just about 15 minutes before the match began. Now, we just need to learn the chants and songs as the excitement was building. The first part was easy. As the announcer introduced each Le Viola player, he would shout the first name and the crowd would shout his last. Since the names were also on the scoreboard it was very easy to join in. This also happened after each goal when we would shout out the scorer’s last name. Next, came the songs. I don’t know why but I really wanted to participate in the singing. After paying very close attention, I discovered the main song went something like this - blah blah blah blah Fiorentina blah blah blah! Yeah, I only managed to learn the Fiorentina part but that was enough to join in each time it came around. Of course, there was also a game to be played. We groaned when the visiting team score first. Then we cheered as we tied the game. We cheered and then groaned when our go ahead goal was waved off because of an offsides called. We cheered wildly when the opposing team player was issued a yellow card. As the game progress, we found ourselves settling into the rhythm. We scream when the referee missed a blatant call or called some stupid little penalty against us. We booed each time the opposing team took an obvious dive to gain a call in his favor. Mostly, we just enjoyed the experience. We enjoyed it all from the three 12-year boys behind us (who knew every song), to the espressos at half time, to walking out with the crowd in the glow of a win by the home team. It was everything we hoped it would be. We will continue going to games when the opportunity arises. Hopefully, the soccer gods will now be a little kinder and we will see our next game before the 2018 World Cup. 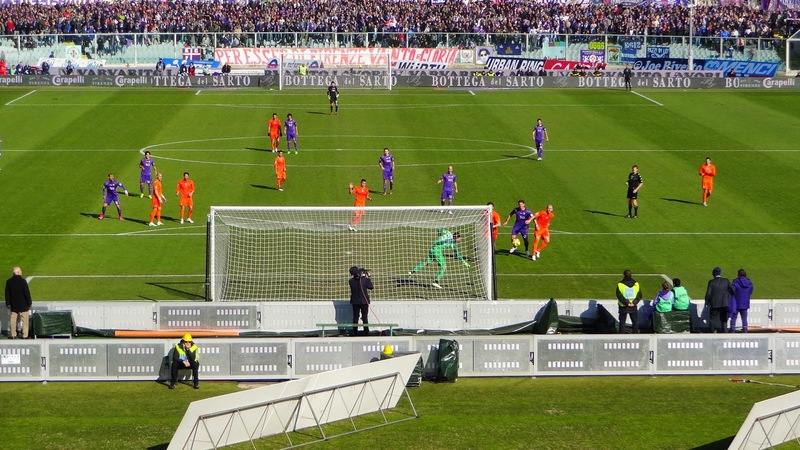 If not, we’ll just sit at home wrapped up in Fiorentina scarves and try to pretend we’re at the game.